Lahti is a city and municipality in Finland.Lahti is the capital of the Päijänne Tavastia region. 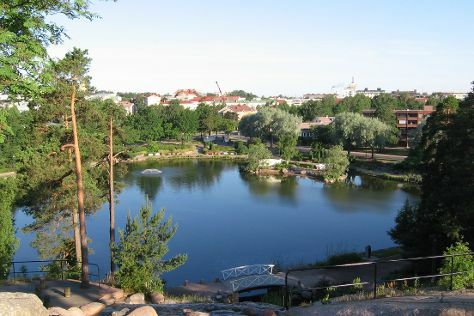 Get out of town with these interesting Lahti side-trips: Kotka (Kymi Church, Sibelius Park, & more), Kouvola (Repovesi National Park & Tykkimaki Amusement Park) and Haemeenlinna (Museo Militaria, Hame Castle, & more). There's much more to do: see the interesting displays at Motorcycle Museum of Finland, brush up on your military savvy at Parola Tank Museum, pause for some serene contemplation at Ristinkirkko, and tour the pleasant surroundings at Messila Maailma Oy Ski Center. To plan Lahti vacation without wasting time, ask Inspirock to design an itinerary. If you are flying in from Hong Kong, the closest major airports are Helsinki Vantaa Airport, Tampere-Pirkkala Airport and Turku Airport. In March, plan for daily highs up to 1°C, and evening lows to -5°C. Cap off your sightseeing on the 5th (Fri) early enough to travel back home.